And, like any chase to this rogue agent, travel is exciting, unusual, and unpredictable. Have you ever taken a ride on a slow boat to China? Well, Carmen San Diego has, and maybe you should too. 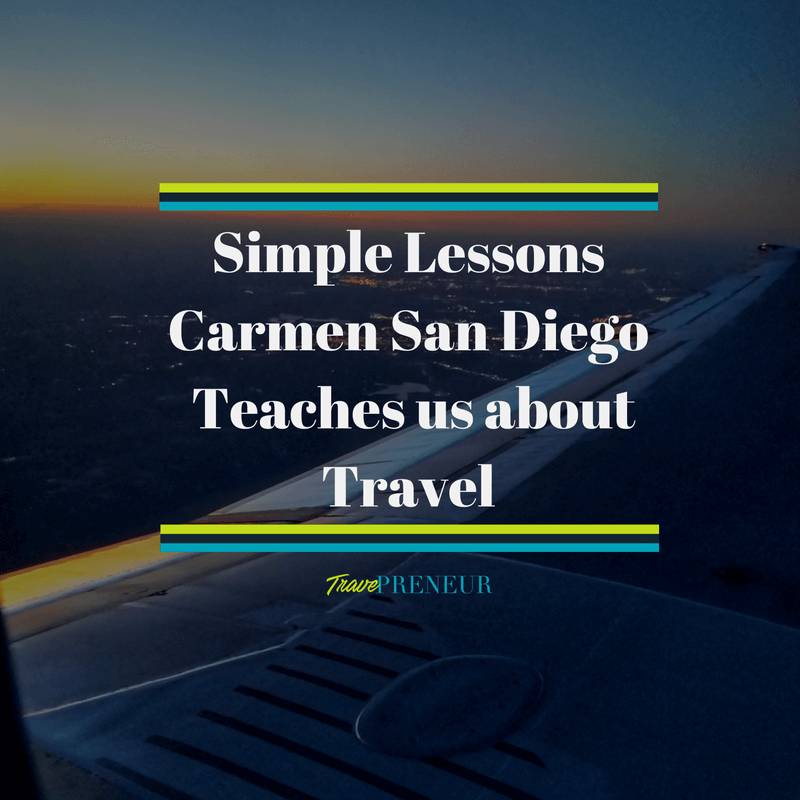 Because she blazes around the world in the blink of an eye, what Carmen San Diego teaches us about travel is more than sneaking around the globe to steal. Of the 195 countries in the world, how many can you locate on a map? Test it and see. Ideally, students take geography classes in elementary and/or middle school. But, I did not. To be honest, I can point out the seven continents, the US states, and several other countries on a map, but that’s all. The lack of geographical awareness is not much a hindrance as it is an embarrassment. With Carmen San Diego exploring the world one theft at a time, she surely knows geography better than anyone I know. She even introduces music, culture, and historical sites from each region she visits. While not advocating for thievery, Carmen’s adventures consist of stolen items from countries around the world, including keys to the Forbidden City, winning puck from the first Stanley Cup championship, and Uluru. *Note: Can you guess where these items are from? Take it from her to learn about the world and so much more. Carmen boasts that her travels, or rather crimes around the world, are routine schemes. Yet, traveling is not routine. The real reason why she commits these crimes because she looks forward to an exciting chase. What’s being chased, if not Carmen herself? Experience and knowledge. Although intangible, travel is an experiential adventure. To have fun, we participate in activities that we enjoy. To learn, we interact with people and their environment. If it was up to Ms. San Diego, our lives would be a never ending chase of travel. Travel uncovers the world’s greatest treasures. We are compelled to travel because of its rich and interesting history. Starting from a buried city in Pompeii, jungle in South America, or aboriginal rock art in Australia, there’s a story behind every city. These treasures lie amongst the landscape, buildings, and people. True discovery of the world’s best-known monuments, landmarks, and treasures started with traveling. Think of well-known travelers, Waldo, Santa Claus, Anthony Bourdain, Ernest Hemingway, Lewis & Clark, Amelia Earhart, and so much more. They have trekked across this globe for many reasons, but each has revealed a little piece of the world. Now, it’s our time to see it for ourselves. Challenges are a normal part of life. Even Carmen face them when eluding capture by the ACME agents. Travel, in the same manner, presents some challenges believed to be our greatest yet. 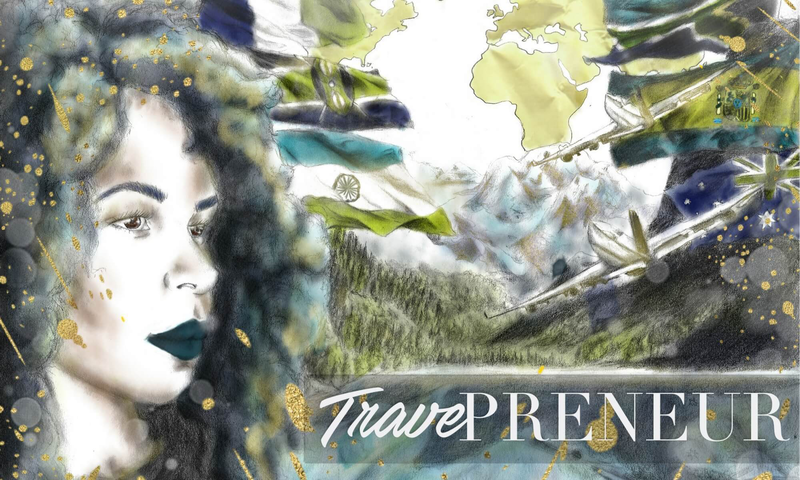 Traveling, no matter domestically or internationally is a step outside our comfort zone. We usually choose a destination we have never been to, don’t know the language, or don’t have any family or friends. Basically, travel is a gamble. It’s a gamble on safety, level of fun, and money. It’s like putting all our eggs in one basket and hoping for the best. While life comes at us from different directions, we are left with making routine decisions. Travel causes us to think whether we want to fit in the box and remain at home OR decide where to go (and with whom) again and again. Carmen’s got the world in the palm of her hands. She’s a cultural rebel. Not only because she switches places so often, but also she utilizes culture to her advantage. She tests our knowledge of regions and its culture, forcing us to rebel against stereotypes or preconceptions about a particular place. Her swift movement sends the message that culture isn’t subtle nor stationery. As quickly as we move, culture does too. And, rebels are born when these places are experienced firsthand, rather than through the eyes of another person. So, get up and rebel! Culture is waiting, and so is Carmen. 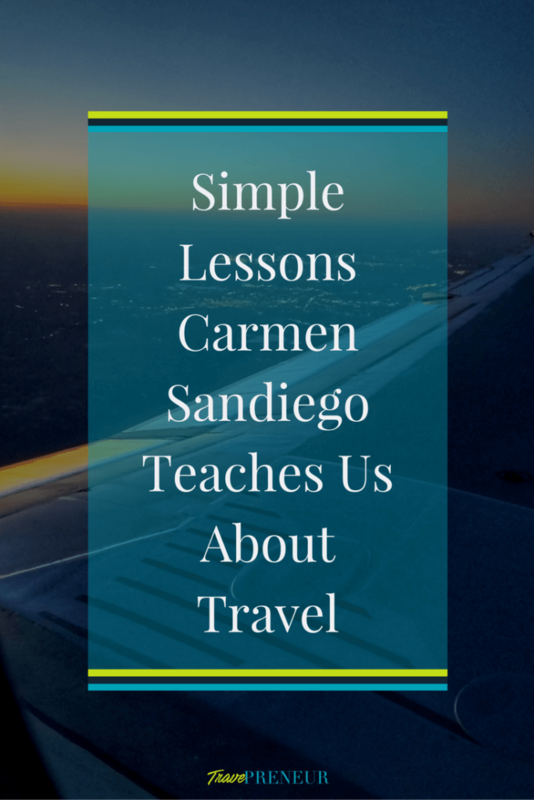 Can Carmen San Diego really teach us about travel? We’ll just have to find her and ask! Let’s get our adventures started. My next stop: Washington DC! What’s yours? Comment below and share your adventures! Hey! I'm Adriana. I'm a city girl with a taste to explore the world while seeking to do good. Not too long ago, I left Miami behind for undergrad (Go Gators!) and departed the country for grad school (I ❤ Spain). And, I returned home looking forward to more adventures, stories, experiences, and social impact. Hence, the birth of Travepreneur. What Does #GetSomeCulture Mean and Why You Should Know!